Wolzek = Sobibor? Monowitz = Birkenau? The first conjunction of my topic title comes from a response of mine to Muehlenkamp's. I will quote the relevant passage. "He named a camp that didn't exist": he wrongly referred to the Sobibor extermination camp as "Wolzek", that was all. " Okay, let's say you win on this one. Wouldn't disprove how he exaggerated the numbers and WAS SUBJECT TO TORTURE AND THREATS as admitted by Clarke, the Jew. Now this reminded me of something that was revealed in another thread about Hodys in a debate between Germania and Reinhardt. Here is what was said. anyway, Morgen in his IMT testimony simply confused Birkenau with Monowitz. this is no big deal. Another lie. As Dr. Stäglich clearly has pointed out, Morgen didn't confuse Monowitz with Birkenau, for he had stated the »extermination camp Monowitz« had been situated in a large industrial plant and couldn't been recongized as an »extermination camp«. Während Morgen vollkommen richtig das Lager Monowitz als in einem weitläufigen Industriegelände gelegen beschreibt, bleibt er also dabei, daß hier das "Vernichtungslager" gewesen sei. That was my last answer to "Germania", because I don't discuss with professional disinformation propagandists. Your behaviour makes clear, what agenda you have. Now we know Reinhard annihilated Germania on this issue. So I was thinking, is it possible that revisionists have an answer to the Wolzek issue that extermination theorists have as shown above, like they did to the Monowitz issue? The deniers' explanation is that this made-up camp "Wolzek" was invented out of nothing, because Höß was simply tortured into confessing to things which did not exist. But the paradox is resolved by reading the interrogation transcript and looking at the map. The camp was there. It was not invented, just misnamed. 2. he just got its name wrong. Why do Holocaust-deniers rush to embrace the wrong choice? The answer is left as an exercise for the reader. And why did Höß think the camp was named "Wolzek"? That's a mystery whose answer may never be known. But considering that his job was to run the Auschwitz camp, three hundred kilometers away; that the extermination program was always kept under strictest secrecy; and that the surrounding territory had been conquered and thus bore names in both his native tongue and Polish: a misunderstanding is surely not out of the question. "Here is an example of a confusion at least as serious as the error of "Wolzek." A French author, speaking precisely of Hoess, tells us (p. 43) that he was incarcerated at the prison in "Krakau," and on the next page, places him in "Cracovie." But Krakau is the German name of the city called Cracovie in French." Not even the most dedicated Holocaust-denier would suggest that their colleague Rassinier was tortured into writing a book. So guys, does this counter argument wash? Even if it did, how does this still detract how Hoess was not only tortured but also had his life and the lives of his family threatened as admitted by Clarke, the Jew, who led an interrogation of Hoess and later wrote admitting what Hoess went through? I asked this of Muehlenkamp when I responded to him and he simply side stepped it. Re: Wolzek = Sobibor? Monowitz = Birkenau? and then going on into page four. I'll post a few select quotes. "Everthing [Hoess] he said was backed up by as many documents". "The "final solution" of the Jewish question meant the complete extermination of all Jews in Europe. I was ordered to establish extermination facilities at Auschwitz in June 1941. At that time, there were already in the General Government three other extermination camps: Belzek, Treblinka, and Wolzek. [sic] ("Trial of the Major War Criminals Before the International Military Tribunal - the "blue series". The text appears at Vol. XI, p. 416, and Vol. XXXIII, p. 277. Document 3868-PS, Exhibit USA-819)." Wolzek simply is an invention of Hoess. Treblinka and Belzec at this time weren't yet constructed, so another invention. In the summer 1941 the term "Final Solution" don't have anyone criminal significance. Demonio, Auschwitz and Majdanek were WVHA camps. But Auschwitz came to be under the RSHA jurisdiction once the extermination program was drafted. Wolzek means Sobibor, it is in the vicinity of Sobibor and is the missing Reinhard camp that we all know existed. Example Majdanek is also referred to as Lublin. As usual, Chalutzim and Demonio ignore the crucial issue, which is that Hoess claimed that Belzec, Sobibor (Wolzek) and Treblinka were in existence as extermination camps in June 1941, when he claims he was given an order to establish extermination facilities at Auschwitz. That is a blatant historical falsehood. Although Belzec had been in existence as a transit camp since at least December 1939, it did not begin to operate as an extermination camp until March 1942. Sobibor did not begin operation until May 1942, and Treblinka not until July of that year. Why have Chalutzim and Demonio ignored that falsification of history, and sought to side-track us over the non-issue of Wolzek as an alternative name (perhaps garbled form of Wolczyzne) for Sobibor? The falsification shows that Hoess's whole account of the development of an extermination program at Auschwitz simply cannot be trusted. It is full of chronological impossibilities like the above. Last edited by Drew J on Sun Nov 22, 2009 5:16 am, edited 1 time in total. On to some select quotes from page four. Demonio continues to display his abysmal ignorance, as if he were somehow proud of it. And that is not a personal attack, simply a statement of fact about the quality of knowledge that he has displayed. He may well be a really sweet guy; but he just does not anything about the command structure of the German concentration camp system, and stubbornly refuses to learn. The Auschwitz-Birkenau complex was subject to the Inspectorate of Concentration Camps located in the WVHA throughout its existence. It was never under RSHA jurisdiction. The only Jewish locality under RSHA administration was the Theresienstadt Ghetto. Every concentration camp had on its staff a security detachment, nicknamed the "camp Gestapo", that was responsible for security. This detachment did report to the RSHA. Its role was to keep a watch out for any signs of rebellion by the prisoners, any sign of subversion, escape attempts etc, ie normal security work. To that end those detachments carried out interrogations of suspected prisoners, often very brutally; its members were feared in the camp. But the "camp Gestapo" was not responsible for the general treatment of the prisoners, for their assignment for labour, for their selection as fit or unfit for work, nor for the operation of Aktion 14f13 under which prisoners unable to work were killed by gassing or lethal injection. All killings of camp inmates or new arrivals unable to work weres carried out by "Sanitaeter", members of the camp medical and hygiene staff, under the supervision of the camp doctors. The "Sanitaeter" performed both the lethal injections and the gassings; they had been trained in the use of Zyklon-B for hygienic purposes. The camp medical staff was quite clearly subject to the Camp Commandant, and ultimately to the WVHA and the Reichsarzt-SS. There is no evidence that they were subject to RSHA authority in any way. All the documentary evidence shows a chain of command from the Inspectorate of the Concentration Camps, located at Oranienburg, to all the concentration camps including Auschwitz. For example, when the Auschwitz camp administration needed some Zyklon-B, it applied to the Inspectorate at Oranienburg. The Inspectorate then sent back an authorisation for Auschwitz to send a truck to the manufacturing plant at Dessau to pick up a designated quantity, which would then be offset against the Waffen-SS share of the allocation to the Wehrmacht hygienic service. The Waffen-SS officer responsible for procuring Zyklon-B was the head of the SS sanitation service, Kurt Gerstein. Contrary to Demonio's betises, the RSHA had nothing to do with the procurement of Zyklon-B. The only thing Demonio got right was his assertion that the RSHA was responsible for organising transports of Jews to Auschwitz. Yes, Eichmann's office in the RSHA was reponsible for organising deportations, of Jews to others, to Auschwitz and to other locations in the Occupied Eastern Territories. The decision on what happened to the deportees was made by the local authorities, not by the RSHA. Demonio may well have been led astray by the successful defence gambit meployed by Pohl and other WVHA officials at their Nuremberg trial. They claimed that, although their office, the WVHA, administered all aspects of the camps, including the use of prisoners for slave labour, the extermination of prisoners was a separate activity run by the RSHA, outside their control. The inexperienced American judges bought the false argument. Pohl was condemned to death, but for the death of slave labourers, not for extermination. But the Pohl defence is demonstrably false. The extermination at Auschwitz of sick prisoners and others unable to work was simply the reverse side of the slave labour program; when prisoners became unable to work, or were assessed as unfit for work on their arrival, they were selected out by the camp doctors and killed by the camp medical staff. The extermination process was quite clearly carried out by camp staff subject to the WVHA, according to criteria related to the utilisation of prisoners for labour, which was quite clearly under Pohl's control. Furthermore, it is documented that Pohl visited Auschwitz on 16 June 1944 and gave Hoess orders relating to the treatment of the Hungarian Jews who had started to arrive by then, including orders for the extension of the camp and for the repair of the cremation facilities. That demonstrates that Hoess was taking his orders from Pohl, not Eichmann. I wonder what other idiocies Demonio will offer in response to this hard evidence. "Mass executions by gassing commenced during the summer of 1941 and continued until fall 1944. I personally supervised executions at Auschwitz until 12/1/1943 and know by reason of my continued duties in the Inspectorate of Concentration Camps, WVHA, that these mass executions continued as stated above. All mass executions by gassing took place under the direct order, supervision, and responsibility of RSHA. I received all orders for carrying out these mass executions directly from RSHA." The reason my statement about Pohl's visit to Auschwitz on 16 June 1944, on which occasion he gave orders to Hoess, is hard evidence is that it is based on a document, Nuremberg Document NO-2359, Aktenvermerk, Betr. : Besprechung anläßlich des Besuches des Hauptamtschefs, SS-Obergruppenführer und General der Waffen-SS Pohl, über bauliche Belange in Auschwitz am 16.6. v. 17.6.1944 (Abschrift). Does Demonio have any documentary evidence for his claim that Auschwitz was under the jurisdiction of the RSHA? Hoess's claim that the orders for gassing came from the RSHA was a falsehood. The claim that the gassing took place under the supervisoin of the RSHA is also false; homicidal gassings were carried out by the camp medical staff, under the supervision of the camp doctors. It is comparable to his statement that mass executions by gassing commenced during the summer of 1941, which is also untrue. The first experiments with homicidal gassing did not take place until the late autumn of 1941, so there could not have been any mass gassings in the summer of 1941. In fact the responsibility for carrying out selections to determine whether new arrivals were fit for labour rested with the camp staff in charge of labour allocation. They decided which arrivals would be used for labour, and they reported back to the WVHA how many had been selected from each incoming transport for labour, giving the reason why the remainder had not been selected, eg too old, too young, too weak etc. That suggests that the decision whether or not to gas a prisoner or preserve him for labour was made by the camp staff on their own responsibility, and not according to any order from the RSHA, and they were responsible to the WVHA for their decisions. Why would Hoess say this if its false ? It serves no utilitarian value for him as he was involved with both departments. I known very well the essay by Jamie McCarthy. I have precisely quoted the statement by Höß from this essay, as everyone can check. This essay is, all in all, bad researched, highly conjectural and don't prove anything -in my opinion, naturally - more than personal opinions of Mr. McCarthy. I must repeat that the mention of Wolzek by Hoess (or, more precisely, by his british captors) is an absurdity. That Höß would say - as suspected by James McCarthy - Sobibor and not Wolzek is only one hypothesis (not new, perhaps, because , Adalbert Rueckerl have advanced this thesis in "NS-Vernichtungslager im Spiegel deutscher Strafprozesse, Munchen, 1979, p. 38) nothing more. McCarthy stress that "the paradox is resolved by reading the interrogation transcript [where only Treblinka and Belzak,sic, are mentioned, but neither Wolzek nor Sobibor] and looking at the map. The camp [Sobibor, because Wolzek - i repeat - don't exist, NB] was there. It was not invented, just misnamed [sic!]." - in Nur. doc. NO-034 (affidavit dated 20 may 1946). And after all this McCarthy have also the courage of stress "Fortunately, an explanation that requires much less mental contortion is readily available."(sic!). But let's go to a more deep analysis of Höß statements. A short time after that Eichmann came to see me at Auschwitz.He revealed the secret plans of the police roundups in the individual countries. I cannot recall the exact sequence anymore. The Jews in eastern Upper Silesia were to be first, then the neighboring areas of the General Gouvernement [the southern part of Poland]. At the same time and according to their location, the Jews from Germany and Czechoslovakia, and finally from the West, France, Belgium, and Holland, were to be sent to Auschwitz. He also mentioned to me the approximate numbers anticipated to be transported, but I don't recall the exact figures. We further discussed how the mass annihilation was to be carried out. Only gas was suitable since killing by shooting the huge numbers expected would be absolutely impossible and would also be a tremendous strain on the SS soldiers who would have to carry out the order as far as the women and children were concerned. Eichmann told me about the killings by engine exhaust gas in the gas vans and how they had been used in the East up until now (5).But this method was not suitable in view of the expected mass transports to Auschwitz.We also discussed killing by carbon monoxide through the shower heads in the shower rooms, but this would also create a problem because too many intricate installations would be needed.(...). Eichmann wanted to find a gas that was easy to produce and one that would require no special installations; he then would report back to me. We drove around the Auschwitz area to locate a suitable place.We thought the farmhouse at the northwest corner of Birkenau near planned Section III would be suitable. The house had been abandoned, and it was hidden from view by the surrounding trees and bushes and not too far from the railroad.The bodies could be buried in long, deep pits in the nearby meadows. We didn't think about burning them at this time. We calculated that in the space available in the farmhouse [later called Bunker I], approximately eight hundred people could be killed using a suitable gas after the building was made airtight.We later found this to be the actual capacity. Eichmann was unable to tell me the precise starting time of the operation because everything was still being planned, and Himmler had not yet given the order to begin. "The "final solution" of the Jewish question meant the complete extermination of all Jews in Europe (2). I was ordered to establish extermination facilities at Auschwitz in June 1941 (1). At that time (4), there were already in the General Government three other extermination camps: Belzek, Treblinka, and Wolzek (3). These camps were under the Einsatzkommando of the Security Police and SD (6). I visited Treblinka [in the spring of 1942, for NO-1210] to find out how they carried out their exterminations (7). The Camp commandant at treblinka told me that he had liquidated 80,000 in the course of one-half year (8). He was principally concerned with liquidating all the Jews from the Warsaw Ghetto (9). He used monoxide gas and I did not think that his methods were very efficient (10). So when i set up the extermination building at Auschwitz, I used Cyclon B, which was a crystallized prussic Acid which we dropped into the death chamber from a small opening." (PS-3868, IMT vol. XXXIII, p. 277). "Here, however, we come up against the testimony of a much-implicated person, Lt.-Colonel Rudolf Hoess, who was for three and a half years the commandant at Auschwitz and who took Gluecks's place as acting inspector, of concentration camps towards the end of the war. Hoess stated that he was summoned to Himmler's presence as early as June, 1941, when Auschwitz was-still a very small camp, and told that the extermination of the Jews of Europe would take place in Auschwitz because of its suitability as a railway junction. In July Hoess received further details from Eichmann, who visited him in the camp, but in the meantime Hoess had already been to Treblinka death camp in Poland to study gassing methods. Hoess came back with a poor opinion of Treblinka and decided to experiment on his own with 'Zyklon B' crystals, which he used effectively soon after Eichmann's visit. Here then we have Himmler deciding on Auschwitz more than six months before the Gross-Wannsee conference and at a time when Heydrich had not received his brief for the 'Final Solution' from Goering. Hoess, however, though a very frank witness, had a habit of confusing several incidents together in his memory, for in another affidavit he declared that he went to Treblinka at a time when 80,000 Jews from the Warsaw Ghetto had been exterminated, that is to say in August, 1942, nearly a year after his own first experimental use of 'Zyklon B.' This would confirm--as appears clear enough from other evidence--that it was in the summer of 1942 and not in the summer of 1941 that Himmler decided on Auschwitz as the extermination centre for the Jews of Western Europe, having in fact waited till Heydrich was dead." ( see The Final Solution: The Attempt to Exterminate the Jews of Europe, 1939-1945. Gerald Reitlinger Beechhurst Press. New York. 1953. Pp.103- 104). The explication given by Reitlinger (and also McCarthy) is simply unreliable. Hoess have confirmed the date in NO-1210,PS-3868, NI-036, IMG vol.IX p.440, and in his memoirs three times. Dating this a episode one year later, is even more contraddictory, because the convocation at Berlin in 1942, signify that the FIRST HOMICIDAL GASSING at Auschwitz (occured between Sept.3-5 1941 for Polish Authority of Auschwitz Musum) have been occurred BEFORE. Also the construction of BUNKER I have been occurred before the SUMMER of 1942 (in March 1942 for Auschwitz Museum). So Hoess would have be anticipated the order by telepathy! So all in this untrue and the explications given are also more untrues. (2) UNTRUE. The Final Solution of the Jewish Question in June 1941 signify the Madagaskar Plan or East Plan i.e. the trasnsfert of Jews to Madagascar or to the East, but not the phyical extermination of Jews. (3) UNTRUE. Wolzek camp never existed. (4) UNTRUE. Belzec was activated on date 17 march 1942. Treblinka was activated on date 23 july 1942. (5) UNTRUE. The Gaswagen was created by SS-Ober. Walter Rauff in september 1941 ( NS Masstoetungen durch Gifgas, p.82). (7) UNTRUE. see above § 4. (10) UNTRUE AND CONTRADDICTORY. Hoess would have been in Treblinka in the fall of 1941 and in spring 1942 at the same time! (11)UNTRUE UNRELIABLE, CONTRADDICTORY All the episode is one falsification by Hoess, which have meet Eichmann for the first time after the date of 11 nov. 1943, when Hoess was transferred to SS WHVA (see L.Poliakov, Auschwitz, paris 1964 p.185). In reality, don't exist anyone document which attested anyone visit of Eichmann to Auschwitz. I limited here my analysis to these simple points, but also much other aspects of "Hoess memoirs"were and are only the result of the torture by his british captors and after of the fantasy of the Poish Authority. May I congratulate Lucius Felix Silla on a masterful analysis of the falsehoods in Hoeß's account, given in his November 1946 statement "The Final Solution of the Jewish Question at KL Auschwitz". One of my first contributions to this forum was an analysis of that statment by Hoeß, and I came to essentially the same conclusion as Lucius. That is not surprising, since anyone who analyses the chronology of the claims made by Hoeß about the Himmler order, the visits by Eichmann, the alleged search for a gas, can only come to that conclusion. On the surface, Reitlinger's solution seems plausible. An extermination order given by Himmler in the summer of 1942 would fit in with the known course of events (and in fact, Hoeß, in another statement "my Meetings with Himmler", claims that Himmler gave him the extermination order during his visit to Auschwitz in July 1942). Furthermore, the planning meeting in November referred to by Hoeß actually did take place, but in 1942, not 1941. Funnily, in his April 1946 interrogations by US intelligence, Hoeß actually said that the planning meeting took place in November 1942. Why did he change the date when he was in POlish captivity? Obviously because his Polish interrogators induced him to make the change. The problem with Reitlinger's solution is that by the summer of 1942, Zyklon-B had been used for homicidal gassing, albeit on a small scale, for several months, since December 1941. Therefore everything Hoeß says about Eichmann looking for an appropriate gas and choosing the place for the gas-chamber is totally false. Close analysis shows that Hoeß has combined two separate stories about the start of homicidal gassing with Zyklon-B, a true one and a false one. The true story goes like this. Soviet POWs identified as dangerous fanatical Communists were being sent to Auschwitz for execution. At first they were shot. Then the camp staff decided to experiment with Zyklon-B, which they were already using for delousing. The experiments, carried out in the cellar of a building in the Auschwitz main camp, were a success, and gassing was used for the executions. Then Crematorium I was converted into a gas chamber by drilling holes in the ceiling. Finally, some time early in 1942, the gassing was relocated to a location near the new camp of Birkenau by converting a peasant house in the village of Brzezinka that was being demolished. Note that the true story of the introduction of homicidal gassing involves the execution of Soviet POWs. It has nothing to do with a plan to exterminate Jews. Later, the gassing technology was also used for prisoners who had become sick and weak and were no longer able to work. The false story is the one involving Eichmann, where Eichmann comes to Auschwitz, decides that gas will have to be used for the planned extermination of the Jews, helps to choose the site for the gas-chamber, and then goes off to find a suitable gas. All demonstrably false, since its chronology is all wrong. The question is, why did Hoeß make up this false story involving Eichmann. I doubt that Hoeß was lying on his own initiative. If so, why include the true story in his account? I believe that he told the true story, but his interrogators, first the British, then the Americans, and finally the Poles, simply refused to believe it. They had the pre-conceived notion that the extermination of the Jews was a grand plan decided at the centre of the German Government, and the decisions on gassing must have come from there. Accordingly, they required Hoeß to come up with a story that they believed to be the truth, so Hoeß made up the story about Eichmann coming to Auschwitz. That was some relevant stuff from page four. Perhaps Demonio and Chalutzim could come up with their own credible explanation for some of the glaring anomalies in Hoeß's claims. Here is one for starters. Hoeß claims that Eichmann came to Auschwitz soon after Himmler gave the extermination order in June 1941 (which implies in July or at the latest August of that year), and told him that the methodology of gassing with vehicle exhaust that had been used in the East for some time would not be suitable for Auschwitz. But the gas-vans were first introduced into service on the Russian Front in December 1941, ie several months after Eichmann is supposed to have come to Auschwitz and told Hoeß about them. Here is another one. According to Hoeß, at the same visit by Eichmann, the two of them selected a peasant house in the village of Brzezinka as the location for the future gas-chamber (even though the gas had supposedly not yet been selected). He then describes experiments with Zyklon-B in the cellar of a building in Auschwitz main camp, and the subsequent conversion of Crematorium I into a gas-chamber. If the peasant house had already been chosen as the site for the gas-chamber, in July or August 1941, why were the experiments with Zyklon-B (held either in September or December - accounts vary) not held in that building? Why was Crematorium I converted into a gas-chamber, rather than installing the gas-chamber in the peasant house immediately? Yes. the testimony of the man that ran the camp. The YMCA is less signifant because it seems to me that they were administering for the RSHA. Eg Whose jurisdiction did the belongings of gassed persons come under ? "Here is one for starters. Hoeß claims that Eichmann came to Auschwitz soon after Himmler gave the extermination order in June 1941 (which implies in July or at the latest August of that year), and told him that the methodology of gassing with vehicle exhaust that had been used in the East for some time would not be suitable for Auschwitz. But the gas-vans were first introduced into service on the Russian Front in December 1941, ie several months after Eichmann is supposed to have come to Auschwitz and told Hoeß about them"
"Here is another one. According to Hoeß, at the same visit by Eichmann, the two of them selected a peasant house in the village of Brzezinka as the location for the future gas-chamber (even though the gas had supposedly not yet been selected). He then describes experiments with Zyklon-B in the cellar of a building in Auschwitz main camp, and the subsequent conversion of Crematorium I into a gas-chamber. If the peasant house had already been chosen as the site for the gas-chamber, in July or August 1941, why were the experiments with Zyklon-B (held either in September or December - accounts vary) not held in that building? Why was Crematorium I converted into a gas-chamber, rather than installing the gas-chamber in the peasant house immediately"
"At that stage they were open to carbon monoxide, sulphuric acid or whatever else would poison people to death. Big deal if they had not settled on cyclon at that point . That proves nothing"
This is statement absurd and - frankly - is first time i read this new theory on Bunker I. Everyone starting from J.C. Pressac to Van Pelt and finish with Auschwitz Museum stressed that Bunker I and II as others gas chambers of Birkenau were equipped or transformed to use Zyklon B.
Mr. Michael Mills have showed too much proofs about the absurdities of Hoess memoirs. I think that the point have been adequately proved by Mr. Michael Mills. "I was arrested on 11 March 1946 (at 11 pm). My phial of poison had been broken two days before. When I was aroused from sleep, I thought at first I was being attacked by robbers, for many robberies were taking place at that time. That was how they managed to arrest me. I was maltreated by the Field Security Police. I was taken to Heide where I was put in those very barracks from which I had been released by the Bntish eight months earlier. At my first interrogation, evidence was obtained by beating me. I do not know what is in the record, although I signed it. Alcohol and the whip were too much for me. The whip was my own, which by chance had got into my wife’s luggage. It had hardly ever touched my horse, far less the prisoners. Nevertheless, one of my interrogators was convinced that I had perpetually used it for flogging the prisoners. After some days I was taken to Minden-on-the-Weser, the main interrogation centre in the British Zone. There I received further rough treatment at the hands of the English public prosecutor, a major. The conditions in the prison accorded with this behaviour. After three weeks, to my surprise, I was shaved and had my hair cut and I was allowed to wash. My handcuffs had not previously been removed since my arrest. On the next day I was taken by lorry to Nuremberg, together with a prisoner of war who had been brought over from London as a witness in Fritzsche's defence. My imprisonment by the Intemational Military Tribunal was a rest-cure compared to what I had been through before. I was accommodated in the same building as the principal accused, and was able to see them daily as they were taken to the court. Almost every day we were visited by representatives for all the Allied nations. I was always pointed out as an especially interesting animal. I was in Nuremberg because Kaltenbrunner's counsel had demanded me as a witness for his defence. I have never been able to grasp, and it is still not clear to me, how I of all people could have helped to exonerate Kaltenbrunner. Although the conditions in prison were, in every respect, good - I read whenever I had the time, and there was a well stocked library available - the interrogations were extremely unpleasant, not so much physically, but far more because of their strong psychological effect. I cannot really blame the interrogators - they were all Jews. Here the history narrated in "Legions of Death" by Rupert Butler published in 1983,Hamlyn Paperbacks. On 11 March 1946, a Captain Cross, Bernard Clarke and four other intelligence specialists in British uniforms, entered the home of Miss. Höss and her children. "If you don't tell us [where your husband is] we'll turn you over to the Russians and they'll put you before a firing-squad. Your son will go to Siberia." "Suitable intimidation of the son and daughter produced precisely identical information." The Jewish sergeant and the five other specialists in third degree interrogation then left to seek out Höss, whom they surprised in the middle of the night, sleeping in an alcove of the room used to slaughter cattle on the farm. <<Höss screamed in terror at the mere sight of British uniforms. Clarke yelled "What is your name?" With each answer of "Franz Lang," Clarke's hand crashed into the face of his prisoner. The fourth time that happened, Höss broke and admitted who he was. The admission suddenly unleashed the loathing of the Jewish sergeants in the arresting party whose parents had died in Auschwitz following an order signed by Höss. The prisoner was torn from the top bunk, the pyjamas ripped from his body. He was then dragged naked to one of the slaughter tables, where it seemed to Clarke the blows and screams were endless. Eventually, the Medical Officer urged the Captain: "Call them off, unless you want to take back a corpse." A blanket was thrown over Höss and he was dragged to Clarke's car, where the sergeant poured a substantial slug of whisky down his throat. Then Höss tried to sleep. Clarke thrust his service stick under the man's eyelids and ordered in German: "Keep your pig eyes open, you swine." For the first time Höss trotted out his oft-repeated justification: "I took my orders from Himmler. I am a soldier in the same way as you are a soldier and we had to obey orders." So it is that Bernard reveals "It took three days to get a coherent statement out of [Höss]" (ibid.). I said documentary evidence, eg written orders from the RSHA addressed to the Auschwitz camp administration, telling them what to do. And yes, I fully agree that the YMCA played no role whatever in running Auschwitz. Nor did the CVJM, the German equivalent of the YMCA. What about the YWCA? Perhaps the young Christian women could do what the young Christian men could not. Not a fan of the "Village People" are you, Demonio? It seems apparent that Hoess' testimony was to one degree or another coerced (and by that standard alone should never have been allowed to be entered into evidence in any trial against any defendant). We have spoken here of his possible motivation or "agenda" for making the statements he did and the suggestion that he made them truthfully because he knew that he faced the noose has been suggested. On the other hand, we also have the fact that Hoess had been told repeatedly that his family faced deportation to the Russians should he not be compliant. Coercion enough. This in and of itself should have been enough (using the legal standards of the day) to impugn his testimony regardless of its veracity. Having said that, legalities are one thing and truth is another. Was he a complete liar? I think not. His part in the brutalisation of prisoners and killings at Auschwitz are indeed very hard to ignore. His testimony before the IMT, his sworn statements, etc. all seem oddly weighted to proving that there was no ill treatment of prisoners (as though this was where he felt his main guilt lay), and yet he then goes on very dispassionately about gassing transports. In short, he seems to deny vehemently the smaller crimes and can't wait to talk volubly about and confess to the larger one. Now we're on page seven. To suggest that the Hoess memoirs are written under duress and false is absurd. Yes he was more like an exotic pet on show whilst in custody. An interogation is an interogation. His timeline at the back of the book does reconcile with an acceptable amount of victims. ie A total of 1.5 to 2.5 million destroyed in the camp by various means. Another thing worth mentioning is that his tone comes across as sincere and from the heart. Also there are many footnotes throughout the text where the press trys to sanitise his ideals and demonise him. Why do they do it ? Because they want you to believe that this man is incapable of human love. But why you ask ? Because the book is written from the heart and goes a long way to humanise a monster. Hoess life is full of ironies. He would take his children to swim in the Sola river (the same river they disposed of the ashes in). I am starting another thread inviting professional psychiatrists to analyse Hoess memoirs and provide their professional opinion on the state of mind of the writer. Such a person could easily spot if the book was written under duress. Demonio, like many others, is failing to distinguish between Hoess's autobiography, written early in 1947 after the completion of his pre-trial investigation, while he was waiting for the trial to start, and the statements he made late in 1946 as part of the pre-trial investigation, which are attached to the published memoirs as appendices. The autobiography was produced by Hoess pretty much in isolation, but the appendices are statements produced by a process of interrogation, with all that implies in the way of "guidance". With the autobiography, Hoess was basically left to his own devices, but he did take up many of the things he had said in his pre-trial statements and try to put a spin on them that put him in the best possible light, eg the Gypsies, without actually repudiating them in toto. The difficulty with both the autobiography and the pre-trial statements is eliminating the distortions and falsehoods, both those that are self-serving and those arising from a need to comply with his interrogators pre-conceptions, so as to arrive at the data that is trustworthy. One of the least reliable part of Hoess's writings, both from the point of view of self-exculpation and complying with his interrogators' pre-conceptions, is everything he said about Eichmann. I tend to agree with Mills' assessment of Hoess' statements both in his testimony and in his autobiography. I would also add that it seems very curious that Hoess was called to testify as a defense witness for Kaltenbrunner before the IMT. Whilst he did lay most of the blame for individual execution orders on Muller's shoulders his testimony seems rather incriminating than exculpating of Kaltenbrunner. A very strange tactic, particularly in a capital case: Denying a little to admit a lot? Michael, a debilitating work schedule does not allow me the time I would like to research this subject the way you very ably have done. I was however able to crack a couple of books over the last couple of days. Auschwitz by Deborah Dwork & Robert Jan Van Pelt on pages 328 & 329 (soft cover), while talking about delays in construction of the crematoria, discusses Eichmanns frustration having to divert trains destined for Auschwitz to Sobibor & Treblinka. Knowing that the operation Reinhard camps would not be able to handle the large transports he envisiond, he apparently telephoned Kammler the SS head of construction in Berlin to ask when the larger capacity killing apparatus would be completed. This would seem to me to show a complicity slightly more than just a transportation technician! Notwithstanding, in a modern court of law is the getaway driver in a bank robbery any less guilty of robbing the bank than those who enter the bank themselves? I do not think so, he or she is involved in the planning, knows the purpose of the plan, it is just that their area of expertise lies in transportation. Best wishes, Phil. Notwithstanding, in a modern court of law is the getaway driver in a bank robbery any less guilty of robbing the bank than those who enter the bank themselves? I have no interest in questions of guilt or innocence, the sort of issue that is the domain of moral philosophers or legal quibblers. My interest is in the macro-level forces that bring about major historical events with enormous consequences, such as the German-Soviet War of 1941-45, of which the destruction of much of the Jewish population Europe was a by-product (albeit one that has caught the popular imagination more than other consequences). Eichmann is important only in so far as the role he played in those events. 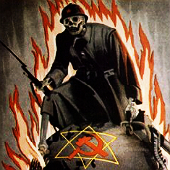 Some lobby groups, particularly the Jewish Establishment, have propagated the view that the destruction of the Jewish population of Europe was the most important enterprise of the German Government before and during the German-Soviet War, ordered at the highest level of that government, centrally planned and driven by a core group of officials with powers overriding all other government agencies. The concept of such a high-priority enterprise requires a figure to play the role of all-powerful leader and driver, and the Jewish Establishment has selected Eichmann as that figure, mainly through the Jerusalem show-trial of 1960-61. The image of the "Final Solution" as a single dominant enterprise with Eichmann as its all-powerful executor came under attack from the very beginning by a number of analysts, including Jews such as Hannah Arendt, even though Eichmann himself at various times in the post-war period seemed to play up to that image, perhaps because in a strange way it was for him more psychologically satisfying to be seen as a superman, albeit an evil one, than as a petty bureaucrat. My own reading convinces me that Eichmann was in fact a petty bureaucrat with a limited role derived from his efficiency in organising Jewish emigration, although he did fulfil that role with great energy and drive. Previously on this thread I have quoted a German document that demonstrates Eichmann's limited role, namely that of the "technische Durchfuehrung der Judentransporte" (technical implementation of the transports of Jews). He did not even have the authority to investigate embarassing incidents that occurred during deportations, such as the public shooting of deportees at a crowded station; that function fell to the local Security Police Commander, to whom Eichmann reported. Now let us have a look at the passage from "Auschwitz 1270 to the Present" to which you referred, and see whether the actions attributed to Eichmann are soundly based. "As construction in the Reich came to a halt, Kammler, Bischoff, Dejaco, and Prüfer did everything in their power to complete the crematoria. Throughout the month of January  regular transports arrived from the Bialystok district, the Netherlands, Berlin and Theresienstadt; the bunkers were hardly able to keep up, and in February Eichmann was forced to divert trains destined for Auschwitz to Sobibor and Treblinka. Eichmann then designated the proud, 2,000-year-old Sephardic community of 55,000 Jews in Salonika for immediate liquidation. Salonika and the rest of northern Greece was occupied by German forces, but southern Greece was in Italian hands, and by the end of 1942 the Saloniki Jews had discovered that the Italians were not interested in applying the anti-Semitic policies of their Nordic allies. Increasingly large numbers of Saloniki Jews sought refuge in the south, and the Italians refused to extradite them to the Germans. Eichmann realised he had to act quickly. He knew that the killing station in Auschwitz was working at top capacity, but he also saw that the Operation Reinhard [sic! ], which were equipped neither with crematoria nor with a holding pen for those deportees who could not be killed immediately upon arrical, could not handle the long-distance 3,000-person-transports he envisioned. Eichmann telephoned Kammler to ask him when the crematoria would be ready. Informed only by Bischoff, who was loath to admit that the construction had fallen two months behind schedule, Kammler reported the current official prognosis: crematorium II would be operational on 31 Jnuary, crematorium IV on 28 February, and crematorium III on 31 March." In the above passage, Van Pelt and Dwork attribute a number of actions to Eichmann. But are those attributions based on hard evidence, or are they simply suppositions, a reconstruction of events with little to back them up? Only one reference is given, to PMOB [Archive of the State Museum Auschwitz-Birkenau], file BW (B) 30/27, 17. The document is not quoted, but it appears to refer only to Kammler's report on the expected dates of completion of the crematoria. Judging by other references to similar documents, it is a document of the Auschwitz construction staff, dealing purely with technical matters. Since the authors have not quoted the document itself, it is difficult to make conclusions about what it contained. For example, how do we know that Eichmann telephoned Kammler? It may be that Kammler's report on completion dates referred to such an approach, but we do not know. The authors make a connection between the forecast completion of the crematoria and the deportation from Salonika, but is that connection supported by the one document they refer to? Does that document specifically tie the completion dates to the expected arrival of Jews from Salonika? Again we do not know. The problem is that the authors make a number of suppositions about Eichmann's activities based on one unquoted document, without making any attempt to take into account the full context of the two main events they refer to, the deportation from the Bialystok District and other areas in January 1943 and that from Salonika in the following March-April. In my opinion, that failure to contextualise has led Van Pelt and Dwork to unsupported and incorrect conclusions. For the information of readers, I will now supply the context. First, the deportations of January 1943. The driving force behind them was an order issued by Himmler in November 1942 that much greater numbers of prisoners be sent to the concentration camps for labour related to the war-effort. He even ordered that the prisons be scoured for inmates fit for work, who were to be transferred to the camps. In December, the head of Amt IV of the RSHA, Mueller, replied to Himmler, stating that the deportation of Jews from Bialystok, Berlin and the Netherlands could make an important contribution to Himmler's requirement for a greatly increased supply of forced labour. Mueller in addition offered some transports of fit Jews from Theresienstadt; but he also asked for permission to send an equal number of transports of unfit Jews from Theresienstadt, in order to relieve the overcrowding in the ghetto. Himmler did something remarkable; he refused permission to send the unfit Jews; he was only interested in Jews who could be used for labour. However, the transports of Jews from the Bialystok District, Berlin, the Netherlands and Theresienstadt went ahead, and a large number of transports arrived in Auschwitz in January, February and March 1943. But what drove them was Himmler's demand for more labour, not an extermination program per se. Van Pelt and Dwork claim that Eichmann diverted trains destined for Auschwitz to Sobibor and Treblinka, without giving any basis for that claim. How well-founded is it? Eichmann himself claimed that he did not select destinations, that other authorities decided where Jews were to be deported from, and where they were to be deported to; he, on receipt of a directive to organise transports from point A to point B, then performed the technical implementation of the deportation. The document I have previously quoted on this thread, which specifically confirms that Eichmann's authority was limited precisely to such technical implementation, backs up Eichmann's claim. Survivor testimony shows the procedure with the deportations from Bialystok District. At the points of departure, a pre-selection of the deportees into fit and unfit was made; the fit were loaded into certain freightcars and the unfit into others. The railway-line leading from Bialystok to Auschwitz and Lublin goes through Malkinia, the junction where the line to Treblinka branches off. At that point, the freighcars containing the unfit were detached and shunted off to Treblinka, where the unfit were presumably exterminated. The rest of the train continued its journey either to Lublin or Auschwitz, which were both labour camps in the centre of a complex of subsidiary labour camps. Thus, the deportation from Bialystok fulfilled Himmler's requirement for increased number of forced labourers to be sent to the concentration camps, while offloading the unfit along the way. We can be reasonably certain that Eichmann's office organised the transports from the Bialystok District, since that was their job. But the selection procedure at the points of departure was not carried out by them, but by the local authorities. Nor do we know where the directive to divert the carriages with the unfit to Treblinka came from. It is also the case that in the first few months of 1943 transports from the Netherlands and France did not go to Auschwitz. But we do not know what their ultimate destination was. A number of Dutch Jews ended up in Sobibor, which by this time had been taken over by the WVHA and converted into a centre for reprocessing captured Soviet ammunition; many participated in the mass-breakout in October 1943 and a few survived. However, other evidence shows that a camp or camps were being constructed in the occupied Soviet Union, and that transports from the Netherlands and France were scheduled to go there. There were also contemporary reports about Belgian Jews arriving in Ukraine. Accordingly, it is a reasonable assumption that the transports concerned went to the camps in the Soviet Union. Again, Eichmann's office would have organised those transports, and some of the evidence about the camps in Russia actually derives from a report by Eichmann on the future program of deportations. But Eichmann would not have selected those destinations, which were possibly part of a separate deportation program. And the evidence certainly does not support the proposition that those transports were "diverted" by Eichmann because killing facilities at Auschwitz could not cope. Now to the deportation from Salonika. According to the evidence of Max Merten, a German official at Salonika, given for the Eichmann Trial, Eichmann's deputy, Rolf Günther, came to that city in January 1943 and advised that the Jewish population would soon have to be evacuated for security reasons; an Allied invasion through Salonika was feared, and since the Jews comprised a large proportion of the population and most of the work-force at the port they constituted a security risk. The first step would be to ghettoise the Jews, which was in fact carried out by the Wehrmacht; the deportation started in March. Mertens' evidence fits the context. By January 1943, British and United States forces had landed in French North Africa and driven German forces back to Tunisia; it was clear that the next step would be an invasion across the Mediterranean into the southern coast of German-occupied Europe. Germany did not know where that invasion would take place; Italy was a possibility, but Greece was equally likely, and we know that it was Churchill's favoured option. Furthermore, an Allied invasion through Salonika had occurred during the First World War, so German fears of a repetiton were quite well-founded. Finally, we know that the Wehrmacht was heavily involved in the deportation from Salonika, and had pushed for it both on security grounds and because the ghettoised Jews had become a logistical burden. Thus, there is no demonstrable connection between the deportation from Salonika and the state of play with the crematoria at Birkenau. The two developments were quite independent of each other. The suppositions by Van Pelt and Dwork are unsupported. Furthermore, there is an unknown factor relating to the destination of the Jews deported from Salonika. Contemporary reports refer to some transports going to camps in Yugoslavia, while others were directed "to an unknown destination", which we now know to have been Auschwitz. The transport of the Jews was actually organised by a German travel agancy in Salonika, which had previosuly specialised in group tourism. The travel agency sold the Jews bulk return excursion tickets for the journey. After the war, a number of those tickets, corresponding to about half the number deported (approx. 25,000 out of 50,000, by memory) were found stored at Auschwitz. That tends to back up the reports that not all the deportees from Salonika ended up at Auschwitz. In summary, almost all of Van Pelt's and Dwork's speculation about the role of Eichmann is shown to be unfounded, when examined against the context in which those particular deportations occurred. Someone just PM'd me with the point that Reinhard never gave a translation for what he posted against Germania; the thing I quoted near the top of the OP. Can someone take care of this? I plan to at least go to some free translation website to try and piece it together. The annihilation warehouse Monowitz lay removes far of the concentration camp. It was in an extensive industry terrain and was to be recognized as such not, and everywhere at the horizon, chimneys and it stood smoked. The warehouse itself was guarded outside through a special troop of men out of the Baltic States, Esten, Litauern and Ukrainern. The entire technical execution lay became almost exclusively in the hands of the prisoner certain in addition himself, that only respectively by a lower leader guarded. " While morning describes lain perfectly correctly the warehouse Monowitz as in an extensive industry terrain, it remains therefore at the same time that here the "annihilation warehouse" had been. The extermination Monowitz was far from the concentration camp. It was in a vast industrial estates and was as such cannot be identified, and everywhere on the horizon were standing chimneys and it was covered with smoke. The camp was guarded by a foreign men into from the Baltic, Estonians, Lithuanians and Ukrainians. The technological implementation was almost exclusively in the hands of certain prisoners themselves, only by a Unterführer, guarded. During morning rightly Monowitz as the camp in a vast industrial estates located describes, it remains so that the 'extermination\". The extermination camp Monowitz was far from the concentration camps. It was located in a sprawling industrial site and was not recognized as such, and everywhere on the horizon and there chimneys were smoking. The camp itself was guarded outside by a special group of men from the Baltic states, Estonians, Lithuanians and Ukrainians. All the technical implementation was almost entirely in the hands of the designated prisoners themselves, who were each guarded only by a subordinate. " During the morning describes the camp situated perfectly correct Monowitz than in a sprawling industrial area, it is understood, then, that here was the "extermination camps had been." "There is a principal which is a bar against all information, which is proof against all arguments, and which cannot fail to keep a man in everlasting ignorance -- that principal is contempt prior to investigation." Is referring to the Konrad Morgen, whose last name translates as Morning so automated translation engines will give odd results. Konrad Morgen, undoubtedly a rather courageous figure and definitely took on some SS personal at Buchenwald, was probably trying to ingratiate himself with the occupiers with his account of attempting to investigate the gas chambers of Auschwitz. I have not seen a trace of contemporary german documentation regarding this. While Morgen completely correctly described the Camp Monowitz as situated in an extensive Industrial area, he also asserted (was of the opinion of/ remained etc) in this regard, that this was an "Extermination Camp"
I believe that he told the true story, but his interrogators, first the British, then the Americans, and finally the Poles, simply refused to believe it. They had the pre-conceived notion that the extermination of the Jews was a grand plan decided at the centre of the German Government, and the decisions on gassing must have come from there. Accordingly, they required Hoeß to come up with a story that they believed to be the truth, so Hoeß made up the story about Eichmann coming to Auschwitz. Again and again in the commentaries, one encounters the presumption that the Poles had "pre-conceived notions" about German guilt etc. The truth is that "the Poles" were entirely subservient to the NKVD. That is to say, any purportedly independent Polish investigation was actually pre-ordained to arrive at results determined in advance by Stalin. I have many times on this site expressed the (in my view OBVIOUS) claim that the allegedly missing Jews were in fact murdered, but by Stalin, in 1945-46. That is to say, that just as the captured Russian prisoners ended up the Gulag and were largely starved to death, so the hundreds of thousands of surrendered Waffen SS troops were starved to death to a man. And the Jews that fell into Red Army hands as the eastern camps were engulfed, were likewise deported and murdered. The Katyn precedent, where Stalin's extermination of multiple tens of thousands of Polish officers was in fact blamed on the Germans (and for which falsely accused German officers were foully hanged) is the proof that Stalin had form. The orders to set up the Germans and to extract a "confession" from Hoess came directly from Moscow. His entire testimony implicating Germans in genocide ought to be viewed as the testimony of Soviet "witnesses" to the Katyn murders is now viewed; - as entirely bogus rubbish produced by the greatest mass-murderer in history; the mustachioed Georgian ultra-criminal Stalin, who lobotomized Russia, reduced Ukraine to porridge and imposed a paralysing lie that cripples Germany to this day. I must make a small but important correction in the translation given above by Jnovitz. That is a huge difference in emphasis. Monowitz, according to Morgen, was not just another extermination camp among possibly many others--it was the extermination camp. The Holocaust story is a hoax because 1) no one was killed by the Nazis in gas chambers, 2) the total number of Jews who died in Nazi captivity is miniscule compared to what is alleged. Drew J wrote: The first conjunction of my topic title comes from a response of mine to Muehlenkamp's. I will quote the relevant passage. I think it's a mistake to make too great an issue of this. Using Google Maps and Streets, I find that Sobibor is a minuscule hamlet of a dozen houses or so most of which look as though they were built since the war. There is a village name plate today but I doubt there was in wartime Poland. The nearest town of any size is Wlodowa, less than 10 km away, and you would pass through it going to and from Sobibor. OK, it's a bit of a stretch from Wlodowa to Wolzek, but given how people mangle foreign names, for a German who has in the same breath referred to Belzek [sic] it does seem to me like the most reasonable explanation. Wlodowa was a 70% Jewish town and its Jewish population was deported to (or via depending on your take on these matters) Sobibor, all the more reason to associate the camp with the town rather than with the nearby cluster of houses. Of course this proves nothing one way or the other about why he may have visited these three camps. Kingfisher wrote: The nearest town of any size is Wlodowa, less than 10 km away, and you would pass through it going to and from Sobibor. OK, it's a bit of a stretch from Wlodowa to Wolzek, but given how people mangle foreign names, for a German who has in the same breath referred to Belzek [sic] it does seem to me like the most reasonable explanation. A German wartime map would probably help to settle the matter and enable us to see how the Germans used to name Wlodowa . Maybe an older German map could also help as German-occupied Poland was formerly administered by Germany-Austria. That's why the demarcation line was established there in 1939. The most likely explanation is that Wolzek is a reference to Wolczyn; a town equidistant between Sobibor train station (and associated camp) and Sobibor town. This [Wolczyn] is a name that was never used by the Germans (after all the camp was right on Sobibor train station). Both towns are tiny places and would have no meaning to a Camp Commandant 100s of kilometers away. The only conceivable way such as name could have entered Hoess’s mouth on that night of March 13/14 was if it had been written as an intelligence briefing on the notepad of the interrogators assigned to extract a confession from him. The issue is not that Hoess was tortured into confessing, but he was confessing to facts (small localties near alleged death camps) that would only have been known to his interrogators. Had Hoess genuinely known of Sobibor, Sobibor was the only name he would have used. "Rudolf Hoess on Aktion Reinhard camps: Did he have a clue about what he was saying?" Nazis tried to create super-soldiers, using steroids ... they sought to reanimate the dead—coffins of famous Germanic warriors were found hidden in a mine, with plans to bring them back to life at the war’s end.